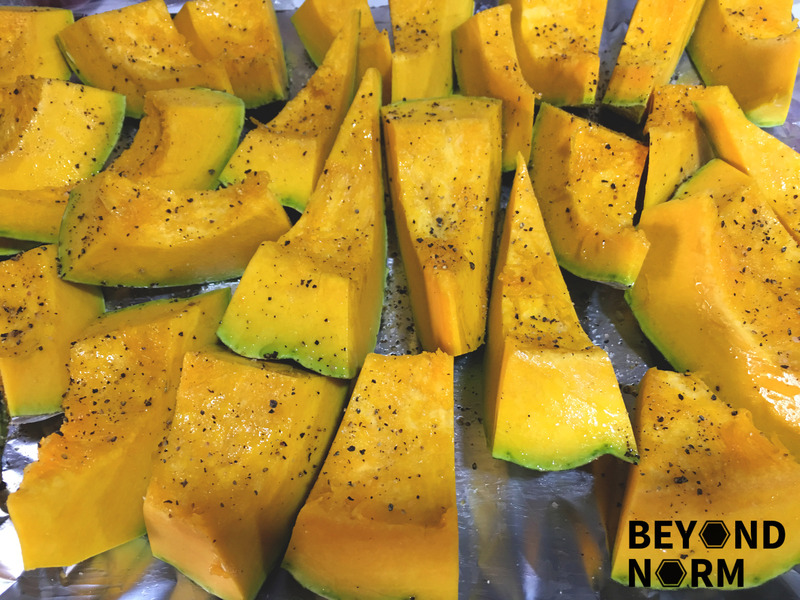 Pumpkins are not just associated with Halloween decoration or a Thanksgiving pie filling, it is an extremely nutrient-dense food; full of vitamins and minerals and the best part: low in calories. With so much goodness in the pumpkin, I thought it will be great to kick start our Christmas series with a Roasted Creamy Pumpkin Soup. This pumpkin soup is yummy, creamy, and so velvety-smooth. It will rock your world in the most wonderful way. You may serve it in small portions or even as a main meal with loads of crusty bread. 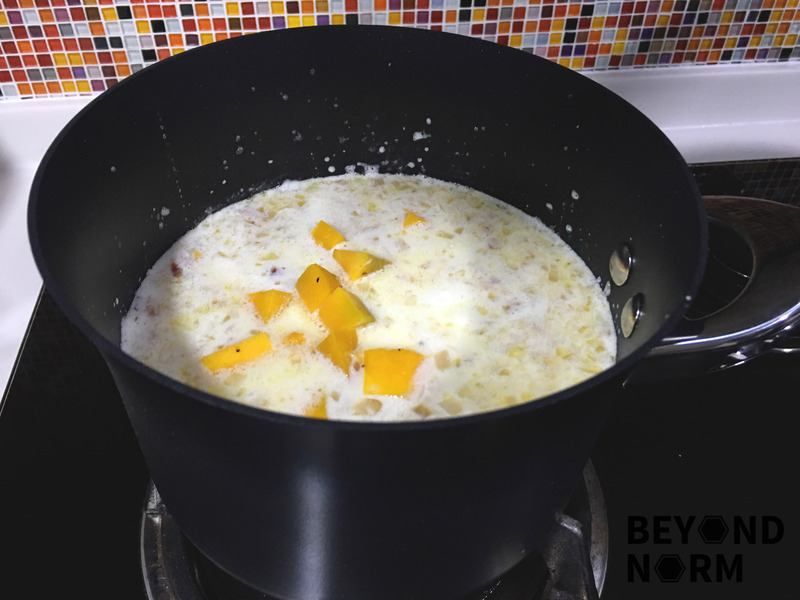 I am sure this soup will be a hit for you and your guests during this Christmas season! We love to hear from you so once you have tried this recipe, we hope that you could provide us with some feedback/comments either via our blog or by joining our Mummy’s Kitchen Facebook Group. You can also like us on Beyond Norm’s Facebook Page or subscribe to our blog via the right side bar to get the latest updates. Cut the pumpkin in half through the stalk, and then cut each half into 4 again. Scoop out the seeds using a large spoon. Brush the surface of each section with the oil and place them on the baking sheet. 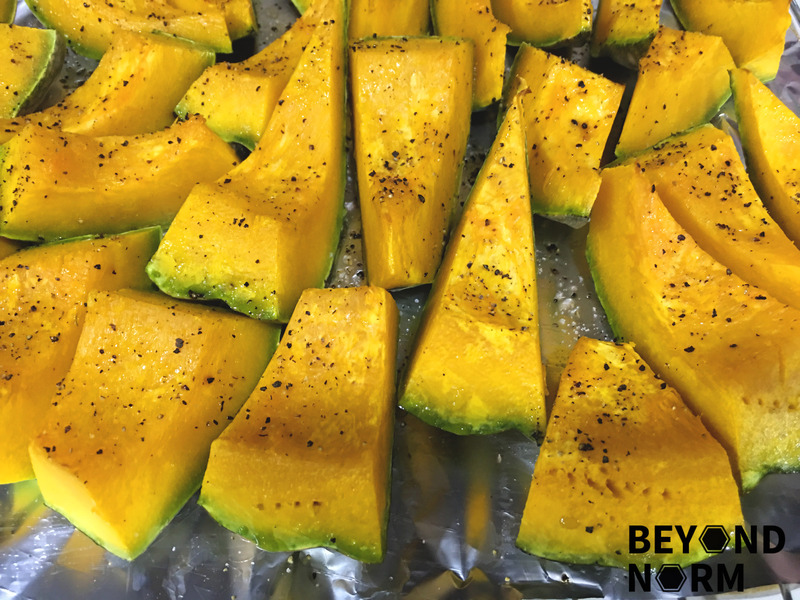 Transfer them to the top shelf of the oven to roast for 25-30 minutes or until tender. Remove from the oven and leave it aside to cool. Next scoop out the flesh from the pumpkin with a sharp knife and set aside. 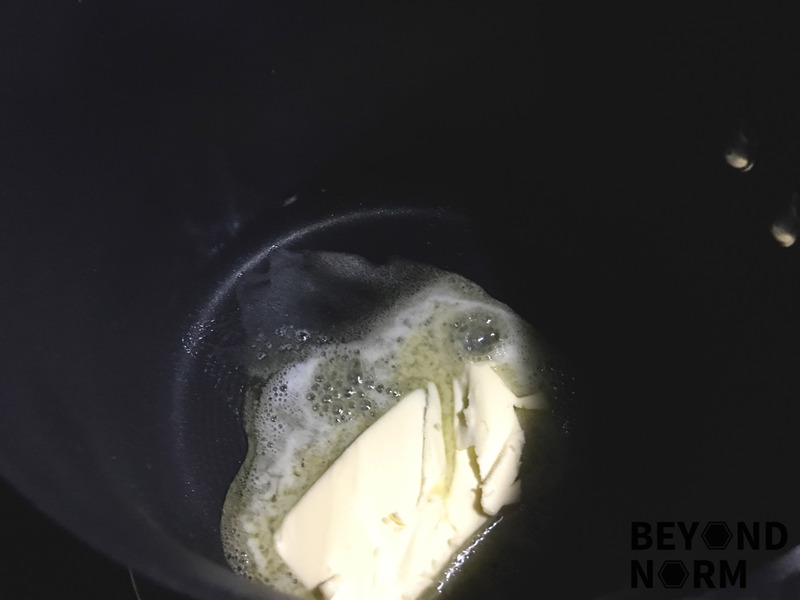 Melt the butter in a non-stick saucepan (I used The Pan With The Circles‎) over medium heat. 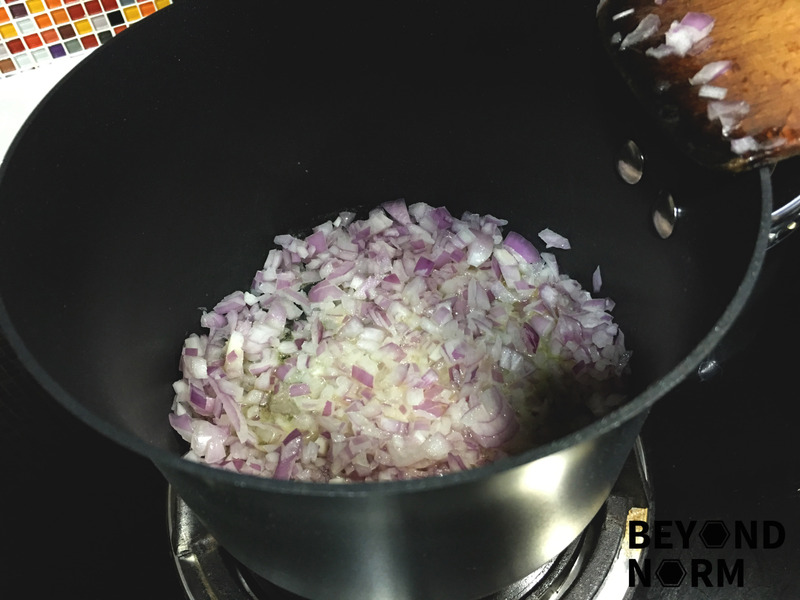 Add in the chopped onion, sauté for 2 to 3 minutes. Then reduce the heat to low and let it cook very gently without a lid, giving it a stir from time to time, for about 10 minutes. Add the stock and the milk to the onions, and leave them with the heat turned low to slowly come up to simmering point. Add the flesh of the pumpkin (Step 6) to the stock with a seasoning of salt, pepper and nutmeg (if using). Then let it all simmer very gently for about 10 to 15 minutes. Transfer the soup into a blender by batches and blend till it is very smooth. 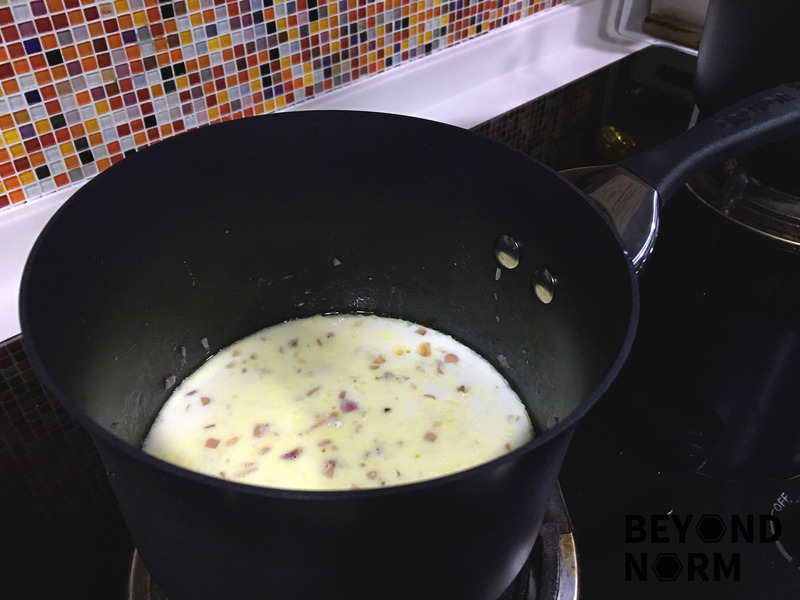 Pour the pureed soup back into the saucepan and reheat gently and stir in some diced cheeses (if using) and ladle the soup into soup bowls. Garnish each bowl with a teaspoon of crème fraiche and sprinkle with parsley if you like. Serve immediately with some crusty bread. onward. All food orders are freshly homemade.